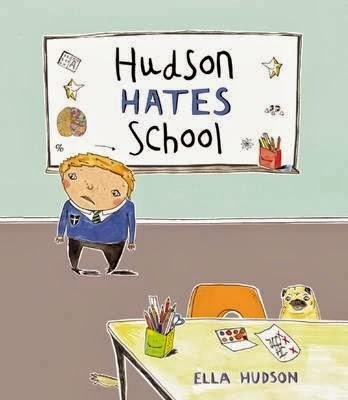 Hudson really doesn't like school. He loves painting and making things and building models and making cakes. But he really doesn't like going to class each day, and poor mum has to virtually drag him (with big smiles) to the schoolyard gate. Hudson hates the spelling test. He has to stay behind at lunchtime because he never gets it right. Everyone else is outside playing in the sunshine and poor Hudson is desk-bound. It's no wonder he hates school. When mum comes to collect him, he bursts into tears, and honestly--you may just tear up, too. Hudson's teacher Miss French knows something is wrong. She phones Hudson's mum and asks her to bring him in for a test. Hudson isn't happy. He hates tests. He's had enough! But this test is a little different. It's fun. And at the end, the tester, Mr Shapland, explains to Hudson why he finds it hard to keep up in class. What I love most about this book is that it doesn't preach, it doesn't dumb things down, it doesn't make a massive 'no one understands' issue out of dyslexia, because we already know so few people understand! What it does do it just outline, in black and white, how the condition makes kids feel, and how the disorder actually works. I had no idea, for example, that dyslexic people spend their lives using most of one side of their brain (the right side) and not very much of the their left side. While most of us use the left side for numerical work and reading, dyslexics do all this on the right side of their brain. This essentially means their brains need to work up to six times harder than someone without the condition. Naturally, dyslexia does not mean a lack of intelligence, and this book makes this flagrantly clear. It also makes clear that kids with this condition CAN be treated, CAN be taught in better ways, and CAN feel better about themselves and their future. Followed up with extra information by the author, this delightful book is a must-have in schools and libraries. Kooky, childlike illustrations perfectly accompany an engaging storyline.